The structure chart of SCENAR devices includes impulse oscillator, control unit, output cascade loaded on the high-quality and more often on the autotransformer circuit, passive and active electrodes. The structure allows to utilize the capabilities of effective electric impulse action based on use of appropriate signal shape, variation of pulse’s amplitude-frequency characteristics and some other tricks [1-7]. And still, this structural chart is similar to existing analogues. In such devices, only electric current is considered as an influencing physical factor. Our study shows that therapeutic effect of SCENAR can be provided by several factors, and some of them take a new look at well-known treatments. The objective of this research is to investigate and analyze physical influencing factors and represent SCENAR-therapy as a new class of electric and musical treatment, with a strong and pronounced vibrotactile (application) component. Electric pulses are the major influencing factor. 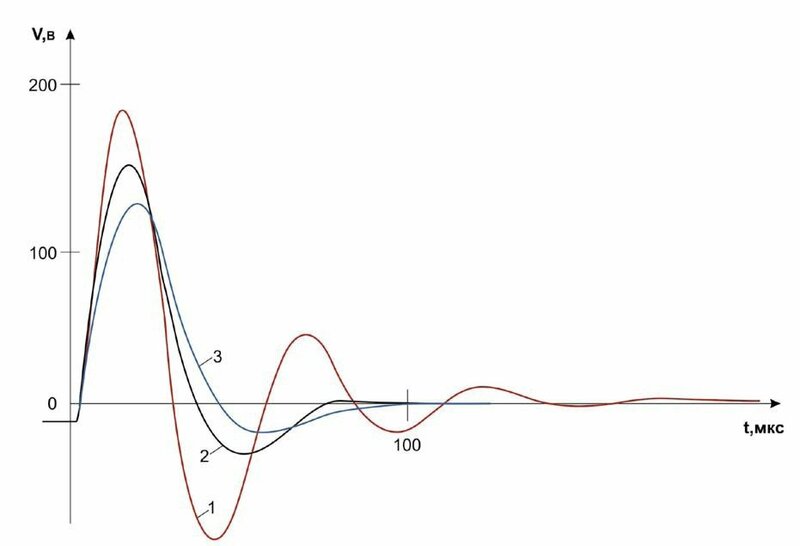 Pulses can be represented as a damped sinusoid (Fig. 1). Upon putting the electrode on the skin, the damped oscillation frequency always decreases (pulse is extending), the oscillation number reduces as compared with that of the signal before the electrode is applied on the skin. At the same time, during therapy (after the electrode is put on the skin), pulses keep extending, and the oscillation number may decrease (which is more often the case) as well as increase. That depends on changes in capacitive and resistive components of the skin impedance (and their relation) between the skin and electrode. At a given power level, voltage amplitude decreases greatly, while current amplitude almost doesn’t change (Fig.2, 3). And SCENAR allows to get various modulations of the generated signal. It should also be considered that most stimulus energy is concentrated on the electrode-skin border. Fig.2 Variants of voltage waveforms in SCENAR stimulation. 1 – signal in 0.22 sec (13th pulse); 2 – signal in 1 sec (60th pulse); 3 – signal in 10 sec (600th pulse). Fig.3 Variants of current waveforms in SCENAR stimulation. 1 – signal in 0.22 sec (13th pulse); 2 – signal in 1 sec (60th pulse); 3 – signal in 10 sec (600th pulse). High-frequency massage is inherently connected with electric pulses. High stimulation amplitude (Fig 1,2 represent actual amplitude values that makes 400-500 V at the moment of touching, and up to 200V in the mode of therapy) causes vibrations of the corneal layer (as well as lucid, if any) similar as flexible film in the electrostatic loudspeaker [8-13]. At this the skin sound can be listened. Pulse rate is 14-350Hz, but spectrums of stimulating sound and vibrations are too wide, i.e. frequency components are up to dozens of kHz and more. SCENAR devices provide various complex modulations of the signal, thus greatly enriching the spectrum with low and high frequency components (see below). In physiotherapy (considering pulse length) signals (Fig. 1-3) can be regarded as low frequent . In mechanical vibrotherapy low frequency is 20-50Hz, while high frequency is 100-200Hz. In the instant case we deal with short pulses of a wide spectrum, so we called it high-frequency massage. It should be emphasized that vibration and sound are determined by the direct influence of high alternating electric field. The point of spectrum of the influencing factors is very important and demands greater attention to it. In SCENAR-therapy electric pulse (Fig. 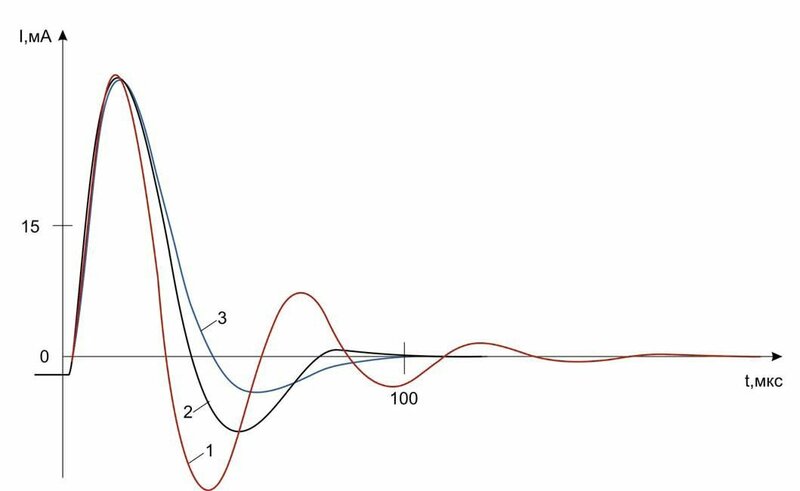 1) is damped sinusoid described as u(t) =U e-?tsin?0t, where U – amplitude, ? – coefficient that characterizes how quickly the sinusoid damps, ?0 – damping sinusoid frequency. Fig. 4 shows the spectral forms of the damped sinusoid (envelope), which greatly depend on ?. In moderate damping of the sinusoid (electric pulse before putting the electrode on the skin, Fig. 1) the spectrum has a pronounced maximum (for the pulse in the Fig. 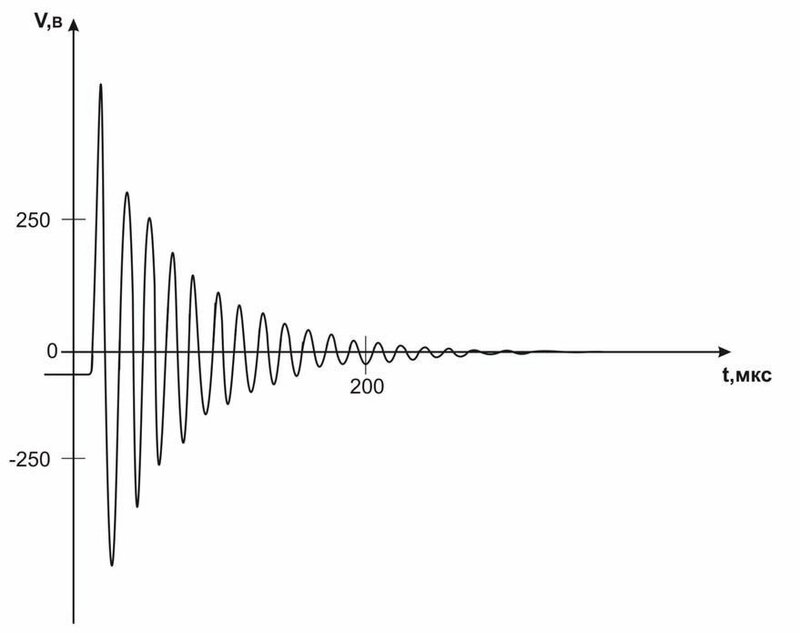 1 with sinusoid period 16 microseconds it equals the frequency f = 62.5kHz). Spectrum of damping sinusoid pulse. With ? increase it becomes plain. The fragment shows the spectrum of repetition pulse train in the figure for 90Hz. When the electrode is put on the skin ? value is too great and spectrum width is about 1.5-2 f0, where f0 _ vibration rate of the damping sinusoid. For example, for the pulse in 0.22sec (Fig. 2,3, signal 1) f0 = 18khz and spectrum width = 27kHz, while in 10sec (Fig. 2,3, signal 3) spectrum width is about 17kHz. Repetition pulse train in SCENAR-stimulation is 15-350Hz. Spectrum of repetition pulse train includes harmonics of basic frequency, whose envelope is in form with the spectrum envelope of a single pulse. The fragment shows spectrum of repetition pulse train for the frequency f=90Hz (3 harmonic components 90, 180 and 270Hz). It should be noted that the signal spectrum in SCENAR-therapy is pretty complicated. In the instant example the peak frequency of the electrode when touching the skin is 62.5Hz, in 22sec the spectrum moves to 18Hz, in 1 sec – to 15Hz, in 10sec – to 11Hz. The spectrum enriches with the slow components that are determined by pulse dynamics. Additional modulations make the spectrum more diverse and enriched. Thus the spectrum includes both the components determined by the pulse change rate and the components defined by the modulation as well as different combinations of these harmonics. In fact, high-frequency massage is also a factor of mechanical influence. Here we will consider the factor connected with different techniques. SCENAR-therapists often use labile stimulation technique in their work , when the electrode is moved along the skin as if massaging the skin in straight lines, circles, spirals, etc. It should be noted that the author of the techniques (Yu.V. Gorfinkel) used stabile and labile stimulation in his work when vibration component was unknown. At the same time such techniques are widely used in vibrotherapy . The problem of metal transfer is connected with high current density in SCENAR-therapy. This issue has never been investigated though many users pay attention that SCENAR electrode becomes pecky in case it was used too long. The amplitude of first half-wave of electric current in SCENAR-therapy is about 10-100 milliampere (mA), depending on the patient’s individual sensitivity. So, considering that the electrode area is not so large (central part is about 2cm2) current density is about 5-50mA/cm2 and in, for example, sinusoidal modulated current therapy 50-500 times exceeds this value. That seems to be the reason for metal microtransfer. Different metals are proven to have positive effect in treatment. Iron positively effects bone tissues, liver, spleen and blood. Gold tones up nervous system and myocard, improves memory and gives energy to the whole body. Silver helps in exhaustion, heartburn, chronic fever, and inflammatory bowel disease. Copper has a positive effect on liver, spleen and lymphatic system functionality. So treating patients with the electrode of a particular metal we may expect a secondary positive effect of SCENAR-therapy. 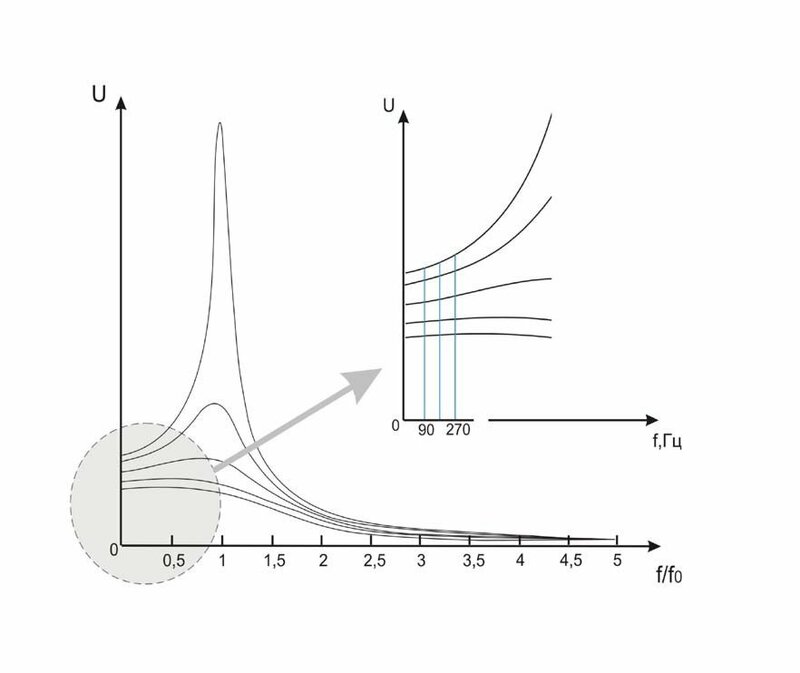 The problem of impact on intercellular fluid is connected with the high amplitude of electric pulses  and also requires additional investigations. Liquid environment of the body mainly consists of water, and water molecules are polar. When supplying the alternating voltage, the dipole is rotating according to the field change at a stimulation frequency and its harmonics. There are hypotheses that every human cell is surrounded by water molecules. If it’s a cell of a diseased organ, then, irrespective of disease, it is surrounded by so called non-structured water. A cell of a healthy organ is surrounded by structured water, and the body itself structures it at the cellular level. Hypothetically we can assert that SCENAR promotes structuring of water (fluid) around cells, and this provides a direction for recovery of the body . Formation of a double-layer capacity in the indirect factor that may influence SCENAR-therapy due to pulse modulation via skin-electrode interaction. Metal ions moving to the electrolytic solution and reverse movement of mobile ions from the liquid surrounding the electrode to its surface may also influence the given therapy. Moreover, dynamic properties of the signal, heavily influenced by the double-layer capacity formation, are used in SCENAR-techniques. The formation of the double-layer capacity is connected with the phenomena occurring on the border of the first (electron) and second (ion) class conductors [8-10]. The metal is in contact with a complex of water solutions including a number of inorganic as well as organic electrolytes. The potential difference (double electric layer) that occurs on the metal-solution border is called the electrode potential. The double layer is formed due to the movement of metal ions to the electrolytic solution and reverse motion of mobile ions from the liquid around the electrode to its surface. The formation lasts for about 0.5-1 sec. Then, electrochemical reactions associated with the local metabolism develop between the electrode and solution. This provides the subsequent dynamics, slow changes of electrode potential, and thus, those of the double layer capacity. On switching the device on, the effects of current pulses are imposed upon the picture described above. Signal variability (Fig.1 to 3) is determined by these two processes: forming of double layer capacity and effect of current pulses. SCENAR-therapy features a great number of influencing physical factors, but identifying feature of SCENAR-devices is simultaneous action of high amplitude electric pulses and pulsating electric field, which causes high-frequency massage of subjacent tissues. Further on we will consider one of the possible aspects of such influence. Therapeutic effect of sound therapy is based on the influence of sounds and vibrations of human voice, musical instruments, natural powers and animal world. Music therapy is a popular and growing medical field in which music and singing is used within a therapeutic relationship. Music therapist uses different treatment thechniques in each concrete case. Already ancient documents and treatises mention therapeutic effect of the music (Pythagoras, Aristotle, Platon, Avizenna). Musical stimulation influences CNS and functions of vital physiological systems. Melodies that make people happy are proven to slow down the pulse, increase heart forse, contribute to widening of blood vessels and normalisation of blood pressure, while the irritative music has absolutely opposite effect. Music perception is roughly divided into acoustic and vibrotactile components. Acoustic perception is realized via acoustic analyzer and allows to perceive acoustic signals of 20-20000Hz (acoustic analyzer enables/allows perceiving sound signals of 20-20000Hz), and vibrotactile component is considered to cause vibrations in the whole body. In music therapy acoustic waves are formed into a musical structure and are supposed to produce a simultaneous impact on the emotional and spiritual spheres of the human, as well as direct impact on the body surface and inner organs. The latter (direct influence on the body surface) is a part of alternative (bypassing organs of hearing, application) music therapy (it should be noted that according to a hypothesis nerve activity is based on transmitting musical vibrations, not electric pulses). Application music therapy is realized by influencing organ projections with acoustic signals. The instance of application therapy when sound-emitting device influenced kidney projection and microphones (loud speakers) influenced biologically active zones . There are theoretical investigations and practical application of simultaneous electric musical influence . The impact is realized by musical electric signal and its simultaneous listening, i.e. combination of electric musical therapy and “usual” (common in music therapy) vibrotactile component. Doctor chooses the composition, which gives positive emotions to a patient, and may also add R. Voll’s therapeutic frequencies superimposed on music. Further on we will show that SCENAR-therapy as a new class of electric and musical treatment, with a strong and pronounced vibrotactile (application) component. It is worth mentioning again that the SCENAR effect lies in skin conversion of the stimulus into the sound, like in the electrostatic loudspeaker. That means that in terms of music therapy SCENAR-stimulation is application stimulation by nature. Specific feature of SCENAR-therapy is that vibrotactile (application) component of the stimulation is realized on the background of short pulses of high amplitude current. Two other major features are determined by the spectrum and vibrotactile component level. Spectrum of SCENAR stimulus is pretty complex and consists of portions of Hz (for example, in amplitude modulation 3:1 component harmonics is 0.25 Hz) to dozens of kHz. Vibtotactile component spectrum is determined by frequency characteristic of the voltage-to-sound conversion. In loudspeakers it is called sound pressure frequency characteristic. Sound pressure is the local pressure deviation from the average pressure caused by a sound wave. The results of several pilot studies (together with M.A. Unakafov) show that vibtotactile component spectrum is narrower than that of the signal, but still is too wide. When influencing factors are used in physiotherapy, low frequency vibration (up to 40Hz) and high frequency vibration (up to 250Hz) are distinguished. Stimulation spectrum in high-frequency massage is of pulse behavior and accounts for several kilohertz at least. We have already mentioned that sound pressure is one of the characteristic features of the loudspeaker. Upon evaluating the vibrotactile (application) component level it seems quite reasonable to come to the term sound pressure – acoustic radiation pressure of the body in the stationary sound field. The acoustic radiation pressure is low if compared with the sound pressure (about three times below the sound pressure level). That means that vibrotactile component is too small in usual (pleasing) music composition. In SCENAR-therapy the skin itself (corneal layer) exerts sound pressure on the body. So, it can be stated for sure that the level of such stimulation is several times higher than the common (when listening to music) sound pressure level. That opens new prospects for using obtained theoretical and practical findings of music therapy. SCENAR-devices realize three types of musical modulations that are similar to that in music therapy . 1. Patient-specific modulations that consider zodiacal sign. For example, C major key compositions are for Aries, while A major key is for Capricorn. 2. Set of keys (modulations) for the therapy in each particular case. Different articles and publications on music therapy state that Beethoven’s and Mozart’s compositions are indicated for people with gastrointestinal diseases; D-flat major compositions treat eye diseases and migraine; D major compositions help in treating kidneys and urinary bladder; rheumatism calms down when listening F major compositions. 3. Musical compositions that bring positive emotions added on user’s request. 1. SCENAR-therapeutic effect is provided by several influencing factors. 2. High-frequency massage, which can be considered as alternative (application) sound therapy, is one of the major secondary factors. 3. Application component in SCENAR-therapy is the action of wide spectrum and unique high stimulation level. 4. SCENAR-therapy with musical modulations is a new class of electric and musical treatment, with a strong and pronounced vibrotactile (application) component.